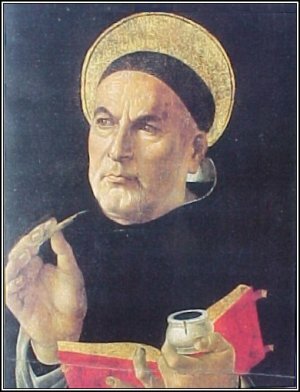 Thomas Aquinas is the greatest theologian of the high Middle Ages, and, next to Augustine, perhaps the greatest theologian in the history of Western Christianity. Born into a noble Italian family, probably in 1225, he entered the new Dominican Order of Preachers, and soon became an outstanding teacher in an age of intellectual ferment. Perceiving the challenges that the recent rediscovery of Aristotle’s works might entail for traditional catholic doctrine, especially in its emphasis upon empirical knowledge derived from reason and sense perception, independent of faith and revelation, Thomas asserted that reason and revelation are in basic harmony. “Grace” (revelation), he said, “is not the denial of nature” (reason), “but the perfection of it.” This synthesis Thomas accomplished in his greatest works, the Summa Theologica and the Summa Contra Gentiles, which even today continue to exercise profound influence on Christian thought and philosophy. He was considered a bold thinker, even a “radical,” and certain aspects of his thought were condemned by the ecclesiastical authorities. His canonization on July 18, 1323, vindicated him. Thomas understood God’s disclosure of his Name, in Exodus 3:14, “I Am Who I Am,” to mean that God is Being, the Ultimate Reality from which everything else derives its being. The difference between God and the world is that God’s essence is to exist, whereas all other beings derive their being from him by the act of creation. Although, for Thomas, God and the world are distinct, there is, nevertheless, an analogy of being between God and the world, since the Creator is reflected in his creation. It is possible, therefore, to have a limited knowledge of God, by analogy from the created world. On this basis, human reason can demonstrate that God exists; that he created the world; and that he contains in himself, as their cause, all the perfections which exist in his creation. The distinctive truths of Christian faith, however, such as the Trinity and the Incarnation, are known only by revelation. i Almighty God, who hast enriched thy Church with the singular learning and holiness of thy servant Thomas Aquinas: Enlighten us more and more, we pray thee, by the disciplined thinking and teaching of Christian scholars, and deepen our devotion by the example of saintly lives; through Jesus Christ our Lord, who liveth and reigneth with thee and the Holy Spirit, one God, for ever and ever. Amen. ii Almighty God, you have enriched your Church with the singular learning and holiness of your servant Thomas Aquinas: Enlighten us more and more, we pray, by the disciplined thinking and teaching of Christian scholars, and deepen our devotion by the example of saintly lives; through Jesus Christ our Lord, who lives and reigns with you and the Holy Spirit, one God, for ever and ever. Amen. Calling Thomas “the greatest theologian of the high Middle Ages” seems doubtful at best. Influential, yes, “greatest” that seems hard to support. What makes him better than say, Bonaventure or Duns Scotus for example? Catherine of Siena? “Greatest” in terms of influence, no doubt. Catherine of Siena’s mystical theology, and her dogmatic work, is based on Thomistic categories. Scotus is a reaction from the Platonic side to Thomas and Bonaventures’ monastic theology is of a slightly different category and wasn’t as influential upon the Medieval mind. Thomas is one of those tinkers who’s influence is so great that it almost impossible to move around him without touching upon his thought. In a great many ways we’re still working inside of his theological paradigm. For example the idea that we can speak truly, but not exhaustively of God and that as such all theological language is analogical and dialectical is were even my Presbyterian Seminary’s Systematics class started. Thomas also provides an example of a thoughtful, prayerful theologian, trying to work out his craft in the light of what passed for the cosmological and “scientific” understanding of his day (Aristotle). we may not always like what he wrote, but his method is still with us, and his model of prayerful theological reflection is one we should remember. As an aside, his little book on prayer and contemplation (entitled, oddly enough On Prayer and Contemplation if I recall correctly) is a good introduction for those of a more logical turn of mind to understand the concepts. What makes Thomas great is his work at correlating Aristotelean philosophy and essentially the theology of Peter Lombard’s Sentences (which already included Thomas’ treatment of theological language as analogical for example). He was influential in a major way only after the Council of Trent (although even Trent relied more on Scotus than Thomas). Thomas marks the beginning of the disruption of a thousand years theology and spirituality exemplified by Bonaventure and the Christian Neoplatonism of Origen, Pseudo-Dionysus, and Augustine. To call him the greatest is to admit that his approach is superior not just the one that won out (largely because Thomism relies on the authority of the Church for all sacred doctrine and thus supports a centralized view of church authority and the right to interpret doctrine). That’s why I’d suggest calling him most influential and not greatest. God is Being // God’s essence is to exist // other beings derive their being // analogy of being between God and the world // knowledge of God, by analogy from the created world // human reason can demonstrate that God exists; that he created the world; and that he contains in himself, as their cause, all the perfections which exist in his creation. Ecumenically, Aquinas has been a disaster, erecting walls that have encrusted a self-aggrandizing, self-righteous, self-justifying complacency that insulates a major branch of the Christian community from its counterparts of differing philosophical and theological understandings, preventing it from seeing anything in a new light, even if delivered by special courier pigeon from the Holy Spirit in person. Sacramentally, Aquinas’ views have transmuted the meaning and devotional dynamics, the relationships between and among God and God’s people, the understanding of God’s purposes in the world and the context of Jesus’ new covenant meal into the substance and accidents of recycled Aristotelian metaphysical abstractions. (Articles of Religion XXVIII had it right.) What Brueggemann says about “Psalms of Orientation” serving the vested interests, hiding and rationalizing the shortcomings, and anesthetizing awareness of injustices and excesses of power by Israel’s unfaithful and flawed kings, is exactly the sociological effect of Aquinas’ philosophy on excessive ecclesiastical claims of authority – in his time and continuing. Christianity does not require or allow for an “official” philosophy, and does not prosper under the constraints of Aquinas’ epistemology, metaphysics, anthropology, ethical positions or its extrapolations when adapted as dogmatic norms. The Christian ethos, when run through the filter of Aquinas’ thinking, loses a great deal of the goodness and faithfulness of a God who is love (not just “being” or “pure act”). I would be content with a simple account of his life, his work (including writings and positions held), including the fact that he has had an enormous impact on the history of western Christianity and on the history of philosophy (without editorializing – much less lionizing!) and continues to be a massive influence for many – almost a third testament — for better and for worse. THE READINGS: Both New Testament lessons are good choices as they are. Nice work, there. The reading from the Apocrypha, Wisdom 7:7-14, a reprise of Solomon’s request for wisdom from YHWH, sounds a bit presumptuous in a selection for Thomas Aquinas; I’d judge Proverbs 9:1-6 to be preferable (both appended below). 7 Therefore I prayed, and understanding was given me; I called on God, and the spirit of wisdom came to me. 8 I preferred her to scepters and thrones, and I accounted wealth as nothing in comparison with her. 9 Neither did I liken to her any priceless gem, because all gold is but a little sand in her sight, and silver will be accounted as clay before her. 10 I loved her more than health and beauty, and I chose to have her rather than light, because her radiance never ceases. 11 All good things came to me along with her, and in her hands uncounted wealth. 12 I rejoiced in them all, because wisdom leads them; but I did not know that she was their mother. 13 I learned without guile and I impart without grudging; I do not hide her wealth, 14 for it is an unfailing treasure for mortals; those who get it obtain friendship with God, commended for the gifts that come from instruction. The selected psalm, 119:97-104, sounds terribly braggadocious in the circumstances. I’d judge Psalm 131 to be more appropriate in light of Thomas’ reported mystical experience and his comment based on it, “all that I have written seems like straw to me.” (Even I realize this is like asking for the moon, but, it’s what I think.) Both psalms are found below, for comparison. 97 Oh, how I love your law! * all the day long is in my mind. 98 Your commandment has made me wiser than my enemies,* and it is always with me. 99 I have more understanding than all my teachers,* for your decrees are my study. 100 I am wiser than the elders,* because I observe your commandments. 101 I restrain my feet from every evil way,* that I may keep your word. 102 I do not shrink from your judgments,* because you yourself have taught me. 103 How sweet are your words to my taste! * they are sweeter than honey to my mouth. 104 Through your commandments I gain understanding;* therefore I hate every lying way. 1 O LORD, I am not proud;* I have no haughty looks. 2 I do not occupy myself with great matters,* or with things that are too hard for me. 4 O Israel, wait upon the LORD,* from this time forth for evermore. I don’t know how that came out complete with its own “Second Edition” appended at the end of the first one. Perhaps it should be labelled, Primum and Secundum. I can’t edit it now! Sorry. In the paragraph I begin with, “I would be content with a simple account of his life, his work (including writings and positions held),” — the “positions” I have in mind are his “job titles,” not his philosophical positions on various topics. Hebrew reading. As the New Revised Standard Version titles this book ‘Wisdom of Solomon’, this listing should conform? ‘Even today continue to exercise ‘—redundancy. Either ‘continue to exercise’ or ‘exercise, even today,’ but not both. The collect refers twice to his holiness of life, but the bio doesn’t mention it. John LaVoe makes it clear that it could be added to the bio, but personally I’d rather see it dropped from the collect. The clarity of his thinking is more than enough to warrant the commemoration. John, are you sure it is Aquinas’s theology that had all the negative results you mention? I was always under the impression that the ‘walls that have encrusted a self-aggrandizing, self-righteous, self-justifying complacency’ (can’t wait for an opportunity to quote that!) were in place long before Aquinas, and that his theology was used by rather than created the gatekeepers. His thought has certainly been useful and fruitful for many people outside those walls. He wouldn’t be the only great theologian to be misappropriated—Calvin was another, as I’ll no doubt be able to go into at great length on May 28th. I tend to look for more biographical information, although I am aware that these bios need to explain why the subject has been selected as a Holy Person. The choice of January 28 is the date of the translation of his relics. He died on March 7. Instead of following the Roman Catholic Church’s choice of that day, we could move his commemoration to March 7, even though that day would be shared by Perpetua and her Companions. However, in view of the established date for such an important saint, I am not recommending this. Line 3, first paragraph: add “at Aquino, midway between Rome and Naples,” after “Born”. Line 1, fourth paragraph: Substitute “was summoned to the Second Council at Lyon, but was injured on the journey, and died on March 7, 1274, at the Cistercian Abbey of Fossanova, southeast of Rome,” for “died in 1274”. Line 2, fourth paragraph: substitute “translated” (the technical term) for “transferred”. Line 2, fourth paragraph: move the first two sentences to the beginning of the paragraph.